Once upon a time, thirteen years ago this month, a certain rabbi was in Jerusalem to attend the World Zionist Congress. While he was there he met one of his students for lunch. The student had been in Israel only two weeks, but she had already begun to fear that she had made a terrible mistake. 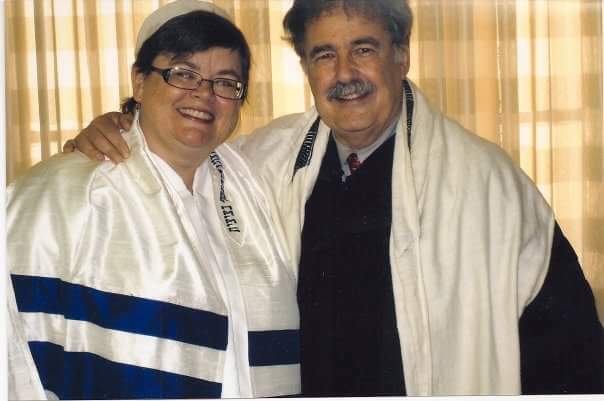 She had broken up housekeeping, sold her house, and moved to Israel to go to rabbinical school. El Al security had questioned her for two days before they let her even get on the plane. Border security had quizzed her for another two hours upon her arrival. Two weeks later, all of her clothing – all of it! – was still lost somewhere in the labyrinthine bureaucracy of Israeli security. It had never occurred to her that her story might sound odd to security, or that sounding odd might generate so many problems. She could not speak Hebrew very well and she felt lost nearly all the time. She had already begun to suspect that she’d spend the year near the bottom of her class, struggling with the language. She clung to those words through the next eleven months, through her struggles with her studies, through the violence of the Second Intifada, through the beginning of the Persian Gulf War, through the deaths of friends back home, through the cancer treatments of her dearest friend, through illness of her own, through everything that year threw at her. Those words reminded her that someone whose judgment she trusted believed in her. She heard his words again and again in the words of the Torah, every time there was a challenge to be met, or a transition to be made. Sometimes it was direct, as in Exodus Chapter 20, when Moses told his people, “Do not be afraid.” They were trembling at the foot of the mountain, afraid of the God with whom they were making the Covenant, afraid to move forward to become the People they were destined to be. I hear those words, less directly but still quite clearly, in the words of this week’s Torah portion, Beha’alotecha. The Hebrews are making the final preparations before leaving Sinai and going out into the midbar, into the wilderness. They’ve gotten comfortable in their camp while they built the Ark of the Covenant. Now the time is coming to leave that comfortable camp to move onwards into the unknown. They’re scared. Advance, Adonai! May Your enemies be scattered, and may Your foes flee before You! When we are starting a new phase of life, two things can make all the difference: first, the encouragement of a mentor, and secondly, ritual that marks the passage of time and works to contain the stress. During my long, tough year, I held on to my rabbi’s reassuring words while self-doubt battered me. And during that year, ritual sustained me. Every week, Shabbat would come and for a few hours, put a pause to the study. I would email my kids and write in my journal. I’d pray and listen to Torah for sustenance, not for recitation or a test. Even more homely rituals sustained me day to day: in the morning I made eggs sprinkled with za’atar on my hot plate and ate them, always the same way. And at the end of the day, I’d put on my nightgown, creep into bed, and read the bedtime Shema from my old prayer book from home. There are things we can learn here: first, it is normal to be nervous about a big life transition. Graduations, weddings, funerals, new jobs, new cities – all are scary. Second, there are things we can do to make these transitions easier: we can accept encouragement from our mentors (as opposed to pushing them away with “I’m fine!”) and we can look for rituals to help us persevere in the task before us. Neither is a magic pill (there are no magic pills.) Rather, they will sustain us as we put one foot in front of the other, traveling a challenging road towards a distant goal. If you are on a new road right now, I wish you a kind mentor and comforting rituals. I wish you a safe arrival at some future time and place, when the unfamiliar has become familiar, and the wilderness has given way to home. You poor thing! That sounds awful! I was there at the same time, and it was scary and overwhelming and awesome and crazy, but I had my own clothes and stuff. How rough! I certainly learned to be grateful for the power of a dry climate to allow for nightly laundry sessions in the sink. I understood the need for security and while it was extremely unpleasant to be perceived as a potential problem, I knew that the discomfort was a price that had to be paid. Going through major (and scary) transitions right now, I am going to keep the message of this blogpost ~ and of this week’s parshah ~ in the forefront of my thoughts. Thanks so much for sharing powerful words of inspiration! Otitis, I wish you koach (strength)! I hope that you will stay in touch as you navigate your transitions. I value your voice very much. Such a powerful phrase in so few words, whether in Hebrew or English. My strength always comes from that in which I believe and you have shown me again the source. Thank you for your story! It made for a good mantra, for certain, especially since it also evoked the love and faith with which it was said to me. Thanks for everything said here!